Let’s talk weight. Let’s talk happy weight. Let’s talk ideal weight. Let’s talk everything in between. Because, as a dietitian, I’ve got a lot of thoughts about weight. Nope. I don’t own a scale in my office, and I rarely, rarely weigh clients. Yup, that’s right. No scale. Honestly, I really don’t care what they weigh. OK sure, I care if they are obese or morbidly obese but chances are, if their weight is that high, they already know. They don’t need me weighing them to tell them that they need to lose weight. They can get that at the doctor’s office. In other words, the scale doesn’t tell me anything I don’t know. It just tells me a number. It doesn’t tell me what my clients ate that day, how they are feeling, confidence level… Nope, just a number. Throw out the scale. Most of us have a happy weight. That weight where you’re comfortable in your clothes, you don’t hate your closet every time you get dressed, you’re happy when you head to the gym, and you don’t deny yourself the occasional brownie, croissant, or piping hot bowl of mac-and-cheese. You’re, you know, happy. Which may or may not be your ideal body weight. Your ideal weight is what you will most often get when you ask a medical professional that wonderful question, “how much should I weigh?” Instead, I’d like you to try to think about your happy weight. It may or may not be a number. More than likely, it’s a feeling. For me, at 5’4″, my “ideal body weight” is 120. 120! I’m not 120. Sure, I could be 120. If I took out dessert, red wine with girlfriends, rest days, and avocado on my sandwiches. I could be 120 if I spent 2 hours a day at the gym and kept my calories to 1400. I could do it, sure. But I won’t. I’m not happy at 120. I’ve been 120 and…. well, I was miserable. Not only was I miserable, but I’m pretty sure I made everyone else around me miserable, too. BL wanted a date night? Not if I didn’t get to the gym earlier in the day. Girlfriends want to meet for happy hour drinks? Unless they were serving steamed kale and tea, I can’t go. Somewhere after college it clicked. In order to be happy, I couldn’t be my ideal weight. An ideal weight that I should point out was not chosen by me, but by a textbook. Instead, I asked myself, where am I most happy? While the only time I really know my true weight is at the doctor’s office once a year, I know that my happy weight is somewhere closer to 130. That’s my happy weight, my happy space. Girlfriends want happy hour? Of course! I’d rather sacrifice my 6-pack ab ambition for quality time with my best friends. BL wants a date night? Of course! I’ll balance my nutrient-dense entree with wine and split dessert. When I start to feel a little out of balance, no big deal. I add a few more miles, change up my meals, and I start to get back to where I like to be. I encourage my clients, especially my weight loss clients, to aim for their happy weight over their ideal weight. Not only is it a more achievable goal, it will also make the process of weight loss enjoyable and not seem like such a punishment. I’ve talked about this before, but when weight loss becomes a punishment, you start to resent it. And when you start to resent it, you give up. Blaming yourself and starting and stopping the process many times over. Make this time different. When you start to look towards your goal weight, focus on the happy rather than the ideal. What about you? Have you ever thought about your happy weight? How do you find the balance between happy weight and healthy weight? I’d love to know! I love this, Alex! I don’t really ever step on a scale outside of the doctor’s office, but I’ve never really thought about that in terms of “happy weight.” I tend to judge how I’m feeling based on how my clothes fit, how I feel during my workouts (or even how often I’m working out) and just how I feel in general. Like you, I try to find the balance between eating out and wine and choosing healthier options most of the time. It’s something I constantly work toward, but you’re right, I do have a happy weight. Sometimes it just takes a little more work to find it. Thanks for sharing such a great message! Yes! My thoughts exactly- thanks for sharing Dana! Thanks Allison! I totally agree- when I was at my “thinnest” I was so unhappy! Gaining a few pounds has actually made me MORE happy! 🙂 Please share! I love your blog! I read your post on Katheats and added you to my feedly right away! Love this post! I totally agree with you on all of it! I love the idea of happy weight and will be using that as a guide in my weight loss goals. I’ve got about 10-15 lbs to lose to be where I was last happy with my body. Hopefully I can avoid the scale and just focus on how my clothes fit and how I feel. Thanks for sharing sensible and realistic information! Sharing this on FB! LOOOOOVE this! Totally agree… I say that every body has their own homestasis weight and for some people it is a little curvier and for some it is more slim. Eating right is way more important than any number on the scale. Plus happy hour and date nights are part of what makes life great. Hi Alex! I use to be a client of yours a couple years ago at pacific. I recently found your blog and Its amazing. I love this most recent post about your ideal happy body weight. You definitely helped me get past a rough part in my life when I wasn’t completely healthy as I could be… Now I am happy and healthy and love my body. I feel like if it wasn’t for you to gently pushing me in the right direction to become healthier I wouldn’t be where I am today. I think that a lot of woman go through ups and down with their body image and it can be influenced by different outside factors, where all they really need is that one person to help them/ sit them down to influence a positive change. Thanks for being a positive female role model to look up to! This is perfection. Thank you. This is fabulous! 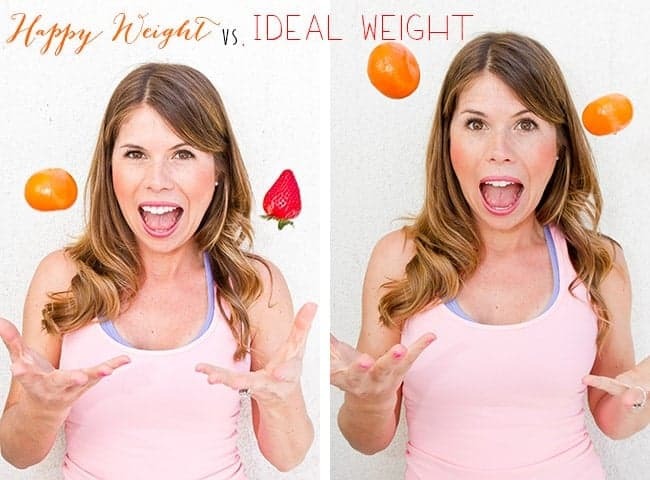 I’ve never thought about there being a difference between happy and ideal weight! I try to not look at a scale and just focus on how I feel. Loved this post. Thanks girl! Fabulous post! When I was seeing private clients I also didn’t weigh them for the most part – like you said, it’s just a number and doesn’t really tell me or them much about what’s actually going on. Sharing your post now in the hopes more people understand this! Thank you so much for this blog post. It was good to read and although I know I shouldn’t always focus on the ideal weight BMI charts and doctors tell me, it’s hard to let it sink in and stay absorbed. I had a doctor back in the day saying I needed to be 90 pounds in order to be healthy (I’m 5 feet). A few years ago, I reached that…and almost all of my bones were sticking through my skin. I’ve gained too much weight back and am struggling to focus on what my happy weight should be and instead, letting the dreaded number of 90 sneak back in. To summarize, there needs to be more posts like your post focusing on a happy weight and that ideal weights are not always correct. The more times we read it, the more likely it is to stick. Thanks! Wow Amanda, thanks so much for sharing. I am SO happy that you enjoyed this article, comments like this make my day! Thanks again for sharing your story, you are going to be an incredible RD!